KenKen collects both personal and non-personal consumer information. 1. Personal Information. Personal information is information that identifies you and that may be used to contact you on-line or off-line. 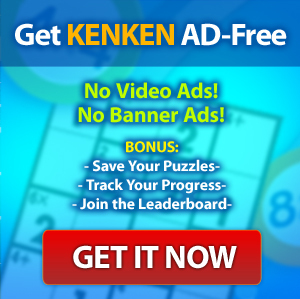 KenKen may collect personal information in varying circumstances, including in connection with your registration for KenKen services accounts; the creation of personal profiles; product, service and subscription orders; customer support and technical service requests; player match up and other head-to-head online competitions; registration for games and special game-specific events; newsletter subscriptions, referral services, and other marketing surveys and email campaigns. The specific personal information collected will vary depending upon the activity and may include, among other information, your name, gender, age, birthday, occupation, educational level, email address, phone number, home address, birth date, mobile phone number and carrier details, and credit card information. If we conduct contests or award prizes, you may also be required to provide your Social Security or other identification number for tax purposes. We will retain your personal information for as long as your account is active or as needed to provide you with products or services. If you wish to cancel your account or request that we no longer use your information contact us at customercare@kenken.com. There may be instances where we are legally required to retain your information. KenKen does not knowingly collect or store any personal information, even in aggregate, about children under the age of 13. 2. Non-Personal Information. Non-personal information, alone, cannot be used to identify or contact you. KenKen may collect non-personal information about your use of our products and services both on our websites and in the course of game play and software usage. For example, when you use KenKen products or services, we may collect certain non-personal demographic information including gender, zip code, information about your computer, hardware, software, platform, media, mobile device, including device IDs, incident data, Internet Protocol (IP) address, network Media Access Control (MAC) address and connection. We may also collect other non-personal information such as username, feature usage, game play statistics, scores and achievements, user rankings and click paths as well as other data that you may provide. KenKen uses your information to fulfill your specific requests, purchase orders and to send you purchase confirmation and other account-related information. In addition, the personal information you provide will allow us to send you messages about things including new products, features, enhancements, special offers, upgrade opportunities, contests and events of interest. You may also later opt out of certain of these communications. Otherwise, KenKen uses personal and non-personal information, both individually and combined together, to better understand the behavior and preferences of our customers, to troubleshoot technical problems, to serve static and dynamic advertising, to enforce our Terms of Service, to ensure proper functioning of our products and services and to help improve them. Your participation in tournaments or other online game events is also conditional upon our collection, use, storage, transmission and public display of statistical data (such as your scores, rankings and achievements) generated through your participation. KenKen will never share your personal information with third parties without your consent. We may, however, share anonymous, non-personal, aggregated or public information with third parties. There may be circumstances where you share information on your own or opt in to allow KenKen to share your personal information with companies and organizations that provide products or services that we believe may be of interest to you. To opt out of further communications from a marketing partner or sponsor with whom your information has been shared, please contact that partner or sponsor directly. KenKen does not disclose any personal information about individuals under 18 years of age who have registered on any of our websites to third parties, or share or disclose personal information other than as set forth in this policy, provided however, that in the event of a merger, acquisition, or the unlikely event of bankruptcy, management of KenKen customer information may be transferred to its successor or assign regardless of age. We may also access and disclose personal information, including personal communications, in connection with report abuse functions in our products and services, to enforce legal rights and comply with the law, or to comply with an order from a government entity or other competent authority, or when we have reason to believe that a disclosure is necessary to address potential or actual injury or interference with our rights, property, operations, users or others who may be harmed or may suffer loss or damage, or when we believe that disclosure is necessary to protect our rights, combat fraud or comply with a judicial proceeding, court order, or legal process served on KenKen. The security of your personal information is important to us. We use generally accepted methods to protect the personal information submitted to us, both during transmission and in storage. No method of transmission over the Internet, or method of electronic storage, is 100% secure, however. Therefore, while we strive to use commercially reasonable means to protect your personal information, we cannot guarantee its absolute security. You may correct or update your account information at any time by logging on our site and navigating to your account settings. Should you be unable to log in or wish to have your account deactivated, contact us at customercare@kenken.com and we will review, update or remove information as appropriate. We may still retain your information in our files however, to resolve disputes, enforce our user agreement, and due to technical and legal requirements and constraints related to the security, integrity and operation of our websites. You may choose to disclose information about yourself in the course of contributing user generated content to KenKen sites or products or services, message boards, user “profiles” for public view or in similar forums on our sites or on third party sites. Information that you disclose in any of these forums is public information, and there is no expectation of privacy or confidentiality. You should be aware that any personally identifiable information you submit in the course of these public activities can be read, collected, or used by other users of these forums, and could be used to send you unsolicited messages. We are not responsible for the personally identifiable information you choose to make public in any of these forums. Note also that in the ordinary course of Internet activity, certain information may be sent from your browser to third parties such as advertising networks and analytics companies. KenKen has no control over the information sent from your browser to those networks or other third parties and recommends that you ensure that your browser settings prevent the disclosure of information you would not like to share.